I don't know if they will go 14nm GPUs this year but it seems doable if they chose to. Medium term it's likely that Nvidia will be more efficient but at least AMD could have a few months head start on 14nm and that might help them a bit. Winning more of Apple's GPU business doesn't have much relevance from a financial perspective and is slightly positive from a marketing perspective. Apple is not that big in PC and more importantly the OEM business in general is low margins. Plus AMD likely would have to offer very good pricing to win Apple. In server, in pro , in high end gaming margins are nice. Even bellow high end gaming margins are good so all those segments are what matters. If they could get an APU in a Macbook that would be great for them even if they don't make money from it, it would greatly improve adoption at other OEMs but remains to be seen what the new cores have to offer next year. Ofc we don't have much of a clue when Nvidia goes for a shrink but they got no reason ,for now, to rush it and it doesn't seem like it will be this year. I think you're underplaying the marketting relevance. I think it'd have much greater worth than you're making it seem. Look at how much they bragged about being the GPU vendor for the Mac Pro, which isn't exactly Apple's best selling machine, and could hardly have made very much money. They wouldn't have played that card so much if it weren't a big marketting plus. Or perhaps they would, considering looking to AMD for good business strategies probably isn't the greatest idea. Anyhow, I'm quite certain it would still be a very good marketing tool. An APU I don't see probable at all though. Apple isn't going to change their CPU vendor anytime soon. It's Intel x86 cores only for the foreseeable future. Writing OS X for AMD chips, whilst certainly not as hard as going from POWER to x86, would still require a lot. And way more than it's worth... Especially since it at the moment is worth nothing. Oh, and again, PC is shrinking, Apple is not. So whilst they're still fair from being a market leader, they're undeniably a bigger and bigger share of the market. And what Apple demands of the hardware they chose is also what the other OEMs either want, or will want. The 2-in-1 route so popular with most OEMs requires similar characteristics from the components as a super thin MacBook. Improving the efficiency of their GPUs will also improve their APU designs, making them better fits for low-power devices, and GPUs are of growing importance, so if they can leverage their GPU department well enough, they might have a better shot at taking that market than Intel (marketting aside). Problem is that Intel is already moving faster. You can't keep reducing expenses. This is a misunderstanding I read often. Once you go below a given level you lose competence in a number of areas. A major problem for them is that as sales continue to fall, large organizations prefer to not do business with them, that reduces sales further. Blackberry is undergoing this problem too, with about the same sales dollars coming in. Apple had that problem in the late mid 1990's. You can drastically reduce expenses in the short-run. 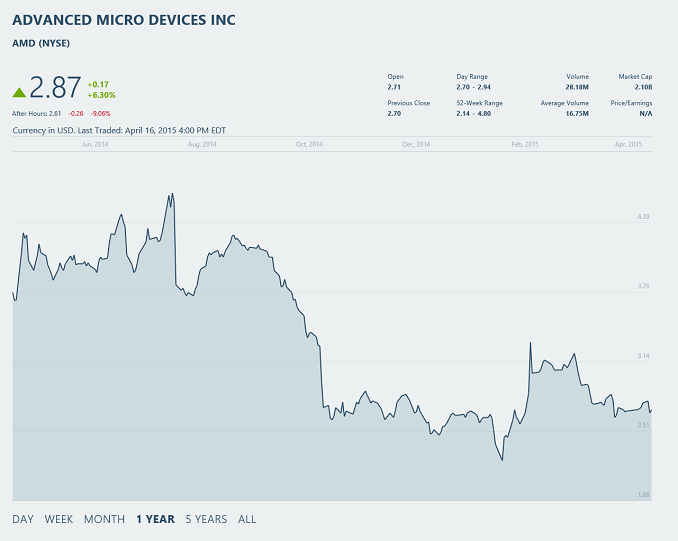 Long-term, AMD will need to obviously begin increasing their expenditures again. But in their current position, they need to start turning a profit. They are likely to grow in emerging markets, allowing this gap to close from one direction, but will still need to turn an overall profit to encourage investment. This will also require them to continue to reduce operating costs, closing this gap from the other direction. As much as it saddens me to see it, AMD must either find a way to make their consumer segment more profitable, offset the short-run losses with enterprise revenues, or continue to reduce operating costs. They simply do not have the investor backing to operate in the negative for an extended period.